Very thorough, even took photos of the car. Flying from Terminal 4 or 5 at Heathrow Airport? Heathrow Maple Parking offers a convenient and stress-free parking service that’s perfect for all travellers. You’ll be met just a short walk from the terminal, from where you’ll be able to head to the check-in desks while your car’s parked in a nearby car park. Whether weighed down with bulky luggage, running to a tight schedule or travelling with small children, Maple Parking Meet and Greet is ideal for ensuring your holiday starts in style. You’ll be just a short walk from the check-in desks, so there’s no need for transfer buses. Your car will be parked in a nearby car park that is monitored 24 hours a day and holds a Park Mark Safer Parking Award. This is the ideal parking solution for customers who require any extra assistance. Maple Parking operates throughout the year, 24 hours a day. Maple Parking will not be able to take your car if it is not legal or is in any other way unsafe to drive. Terminal 4 - (TW6 3XA) As you approach Heathrow Airport, follow signs for Terminal 4 Short Stay Car Park At the entrance barrier, take a ticket (please hand this to our Handover Captain) Drive down to level 2, park in one of the ‘Off Airport Meet & Greet’ parking bays. Terminal 5 - (TW6 2GA) As you approach Heathrow Airport, follow signs for Terminal 5 Short Stay Car Park Drive up the ramp, filter to the right and drive under the yellow height restriction, KEEP LEFT and follow the signs for Short stay Level 4. Follow the Avis signs towards the third set of barriers, take a ticket (please hand this to our Handover Captain). Follow “OFF AIRPORT” signs and park in the ‘Off Airport Meet & Greet’ parking bays. 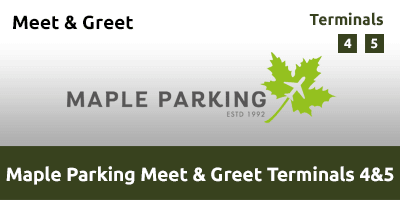 There is no need to call Maple Parking on your return - as long as we have your correct return flight number, terminal and return date we will have your car brought to the meeting point below, ready for when you arrive. If you are unsure or did not give us a return flight number when you checked in, then call our handover team. They will be able to advise the status of your car and get it on its way to the meeting point if it is not already. Please have the unique barcoded card that you were given on arrival to collect your keys from our handover team. If you do not have this then we will need to see and take an image of your passport – which (of course) must match the booking name.